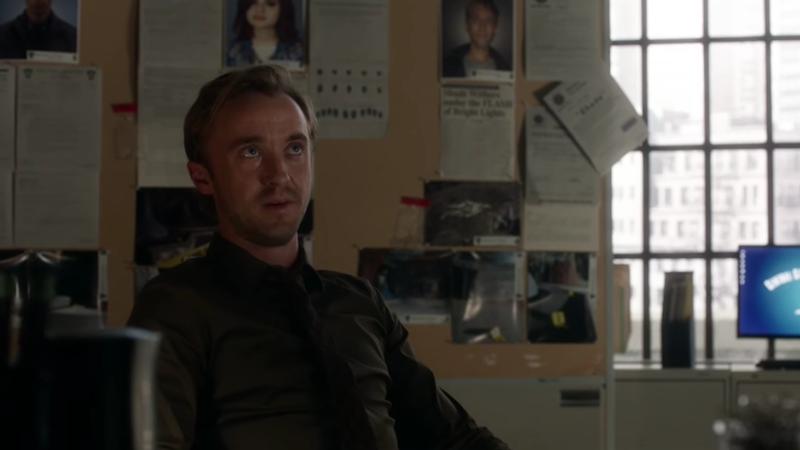 It’s the part at the end where Julian Dorn (Tom Felton) goes ahead and almost reveals everything to Barry Allen (Grant Gustin) by mistake. Barry literally just came to ask some probing questions, so wait a tick before doing something risky. At the beginning of the clip, Julian gives the background of the philosopher’s stone, which is a fun little Harry Potter tie-in. Then Barry asks about Savitar, Julian is not at all shady in his reply, and Barry leaves. And almost immediately after, Julian goes to his secret drawer. Come on, dude, don’t go open your secret costume stash after Barry has just left. What if he forgot something and came back? What would you do? Slam the door shut and turn this show into a comedy?